When Apple announces new software versions during its WWDC opening keynotes, all of the attention is perhaps understandably on the big hitters, iOS and macOS. That doesn’t mean that the lesser lights like tvOS and watchOS are not receiving updates, with the initial beta of the former now available for download along with a list of changes that have gone into the release even though tvOS 11 didn’t get any stage time at the keynote. Available as a download via the Apple Developer Program for registered members, the new update includes new features as well as bug fixes and additional security patches that should go some way to keeping Apple TVs more save and secure than they were beforehand. Chief among the new features is an automatic light and dark mode switch which can be configured to change tvOS’s appearance depending on the time at which it is being used. Home Screen Sync will also allow an Apple TV’s Home screen layout to be replicated across multiple devices linked to single iCloud account, should a user so wish. Apple has also bundled in new background modes and notification support within the latest tvOS version, along with ability to pair AirPods automatically with Apple TV. Other changes that will make less of an obvious impact to users include Focus API improvements and custom sound support as well as layered image improvements while Mobile Device Management improvements will benefit those who have to do that as part of their role within a business. People can also look forward to network-based pairing and development support as well as web inspector support for TVMLKit apps. Right-to-left language support is also added as part of iOS 11 for those who use such languages. While not part of the initial beta release, future beta versions of tvOS 11 will also include AirPlay 2, similar to iOS 11. This will allow multi-room audio via Apple HomePod and Apple TV-connected speakers. It is unknown as yet at which point AirPlay 2 support will be added, however. 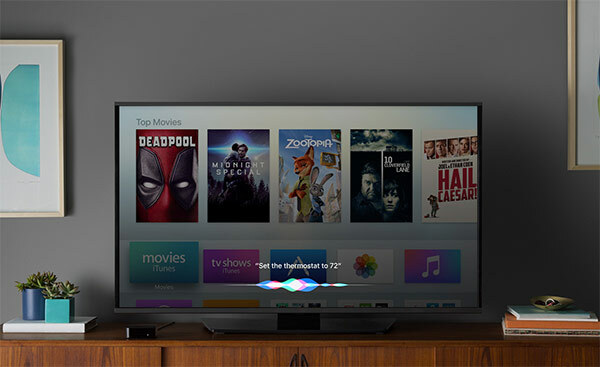 Apple will make tvOS 11 available to public testers for the first time later this month alongside iOS 11 and macOS 10.13 public betas.